This January, we welcomed another international student into the Nigawa family. Anna (17) is the first exchange student to join us from our sister school in Australia, St. Mary’s College Ipswich. She is a keen Japanese language student and loves anime. Despite having been with us just a short time, she already has plans to join several clubs including the cooking club, tea ceremony club, art club and ESS. All of us here are excited to have Anna in our school and we hope she has a wonderful experience in Japan. 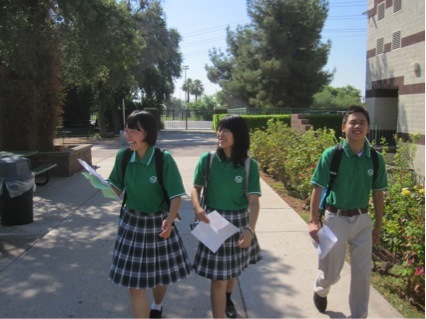 Welcome back to term 3 and to the brand new English blog, “Nigawa Gakuin meeting the world!” This blog will be used to share information regarding Nigawa students abroad, visiting international students and the many activities we have as part of our international program. 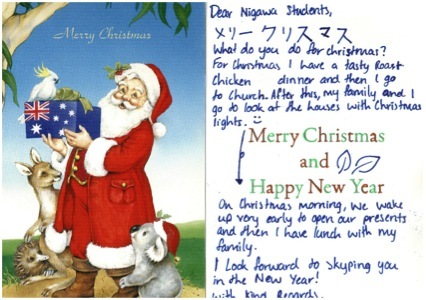 Some of the JHS students received Christmas cards from our friends at St. Mary’s College in Australia last month, so they are now planning to reply with Setsubun greetings. Our partner schools in Australia are now in their summer break, but the school year will start at the end of January, so we are also looking forward to continuing the in-lesson Skype activities that started last year. 2014 is sure to be an exciting year for Nigawa students and our friends around the world.